How to retain patients and revenue despite high-deductible health plans. As a care provider, you know half the battle of patient well-being is access to treatment. But access isn’t just a matter of having—or not having—health insurance. After all, patients with high-deductible insurance plans can pay as much as $10,000 out of pocket before their benefits kick in. As a result, many patients go without adequate care, and many providers struggle with patient acquisition and retention. If you own or manage a private practice, you’ve likely experienced the frustration of investing considerable time and resources into verifying patient benefits only to lose those patients to copay sticker shock. Or you may feel stuck in a constant cycle of pursuing past-due balances. High-deductible health plans (HDHPs) present all kinds of challenges—we all know that. What you may not know is that there are preventive measures you can take to protect your practice—and your patients—from the negative effects of HDHPs. With that in mind, let’s talk about four strategies for ensuring that you receive the compensation you deserve—and that your patients get the care they need. Today’s health care providers can’t assume their patients understand their own insurance plans—especially considering how much the insurance landscape has evolved in recent years. Some patients have no idea what “coinsurance” is or believe being “covered” for therapy means they won’t have any out-of-pocket expenses. Benefit structures can be complicated, and when patients face unexpected costs, they often become frustrated and angry. This may lead them to cancel their appointments and, ultimately, fail to follow through on their treatment plans. However, there are ways to lessen the blow of health care sticker shock—and help ensure high-care costs don’t create a negative experience for your patients. After all, if your patients leave therapy with a bad taste in their mouths, it could end up damaging your practice’s reputation. First off, you should verify insurance eligibility and develop a cost estimate before the patient’s first visit. Don’t wait to send a bill afterwards; in doing so, you risk catching patients off guard with unexpected costs. 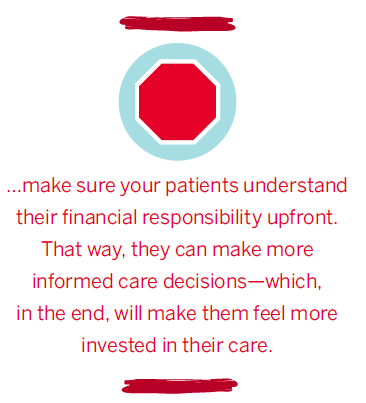 Instead, make sure your patients understand their financial responsibility upfront. That way, they can make more informed care decisions—which, in the end, will make them feel more invested in their care. Plus, patients who receive “surprise” bills may not only stop treatment but also take to social media or online review sites to vent about their frustration—and bad reviews mean bad news for your practice. We’re living in the age of the patient-consumer. In other words, more and more patients are approaching health care with a consumer’s mindset. They want to feel they’re getting what they pay for—in terms of both clinical outcomes and experience. That’s why it’s important to develop a clear value proposition and communicate it to new patients before they begin treatment—or receive a bill. Keep in mind, this begins with your front-office staff. Think of them as the “chief impression officer.” They must be able to make a good first impression by articulating the value of each visit to the patients. This begins on the phone when setting up the appointment and should be reinforced on their first visit, even before seeing the therapist––it gets the patient started off on the right foot. For example, if a patient is experiencing low back pain, and your clinic happens to have impressive outcomes data demonstrating your patients achieve better outcomes in less time, compared to other providers, communicate that information to the patient before he or she begins therapy. Create talking points to succinctly communicate this to your patients, and make this information available on your website and other marketing collateral as well––it’s a key differentiator. You could also share general information that relates to the comparison of physical therapy patient outcomes to outcomes for patients who undergo more invasive interventions (e.g., injections or surgery). In doing so, the patient will go into an evaluation with a solid understanding of the value and the “why” of the treatment he or she is receiving—which, in turn, helps justify the cost of care. Therapists would then explain that when patients fail to complete their therapy plans of care, they risk being hit with even bigger costs down the road in the form of additional doctor visits, pain medications, hospital re-admissions, emergency room visits, or even surgery. The idea isn’t to scare them, but to get them more invested in— and enthusiastic about—their therapy treatment. Document your policy. This includes how your practice handles copay collection, billing processes, bad debt collection, and other payment-related procedures. 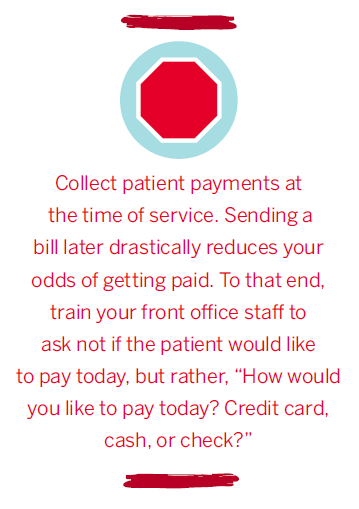 Collect patient payments at the time of service. Sending a bill later drastically reduces your odds of getting paid. To that end, train your front office staff to ask not if the patient would like to pay today, but rather, “How would you like to pay today? Credit card, cash, or check?” And it’s a good practice to remind patients when they’re scheduling their appointment to be prepared to pay a copay. Consider offering financing options. 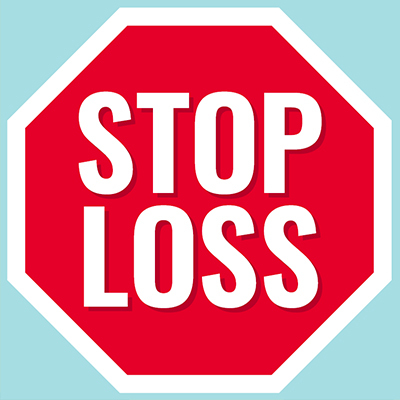 Waiving copays may seem like a kind gesture, but it will eventually add up to a significant revenue loss. It’s also prohibited by many health care plans and can lead to HIPAA (Health Insurance Portability and Accountability Act of 1996) violations, as it could be viewed as misrepresenting charges. Share your payment policy on your website and in your invoices, and have your patients sign a copy during their first visit to your office. Optimize your payer mix to compensate for weaker plans. You can offset the financial pinch of losing patients with HDHPs by dropping payers that aren’t profitable for your practice. Let’s face it: It’s never easy to ask for payment, but with some of these policies in place, it helps automate the process and leaves less room for emotion to enter the equation. After all, as much as you care about serving people first, you also have a business to run. With that in mind, you may also want to look into some alternative routes to increasing your practice’s revenue. One way to boost your bottom line is to incorporate health and wellness services into your practice’s repertoire. As a rehab therapist, you are dedicated to helping your patients restore optimal function and improve quality of life, which makes you perfectly positioned to offer fitness-related programs, holistic health interventions, and telehealth services. Health care reform in general—and high-deductible health plans, specifically—have put even more of a financial squeeze on rehab therapy providers who were already struggling to keep their doors open. But with challenge comes opportunity, and in this case we have the opportunity to evolve our communication strategies, payment processes, and scope of service to not only overcome the challenges associated with HDHPs but also set ourselves up for even greater success in the future. 1 www.apta.org/uploadedFiles/APTAorg/About_Us/Policies/HOD/Health/HealthPromotion.pdf. Accessed September 2017. Dr. Heidi Jannenga is president and co-founder of Phoenix-based software company WebPT, the country’s leading rehab therapy platform for enhancing patient care and fueling business growth, with more than 71,000 members and 9,800 clinics as customers.